Wow, so last night was crazy. I attended the Asian Media Awards 2017 at the Hilton Hotel in Manchester, AS A NOMINEE, with Nazma and the OH. 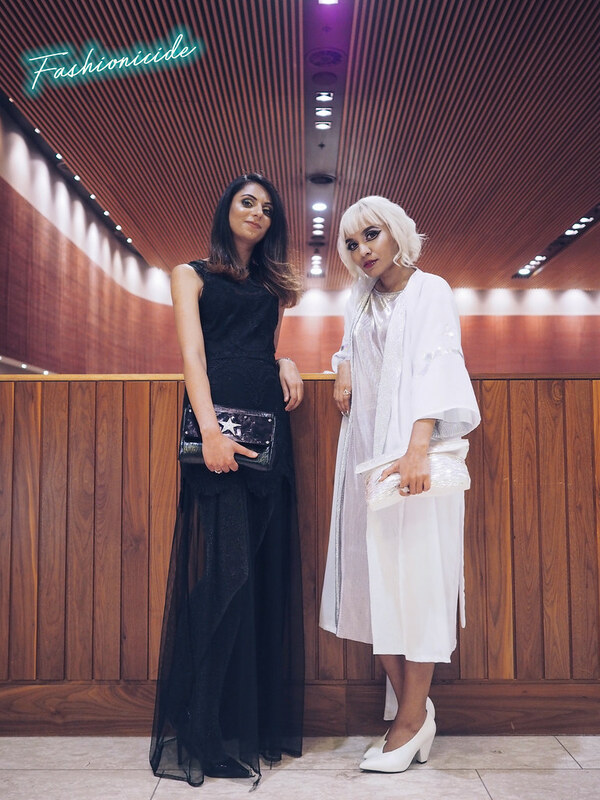 The entire night was pretty surreal, but there were a few moments that really took me by surprise - the first one, upon entry, I had to give an interview to the camera about me, my blog and my outfit. Red carpet treatment! The next surreal moment was seeing the VT for my category appear on the big screen, the announcer call out "Fashionicide" and my Blog Header emblazoned for all 600 or so people to see! Sadly, I didn't come away with the trophy, but it was really heartening to see that the nominees in my category were all female, all talented and so diverse too. Also, despite being rivals for the Best Blog prize, I met Halal Girl About Town in the flesh, she brought cupcakes and now I love her. 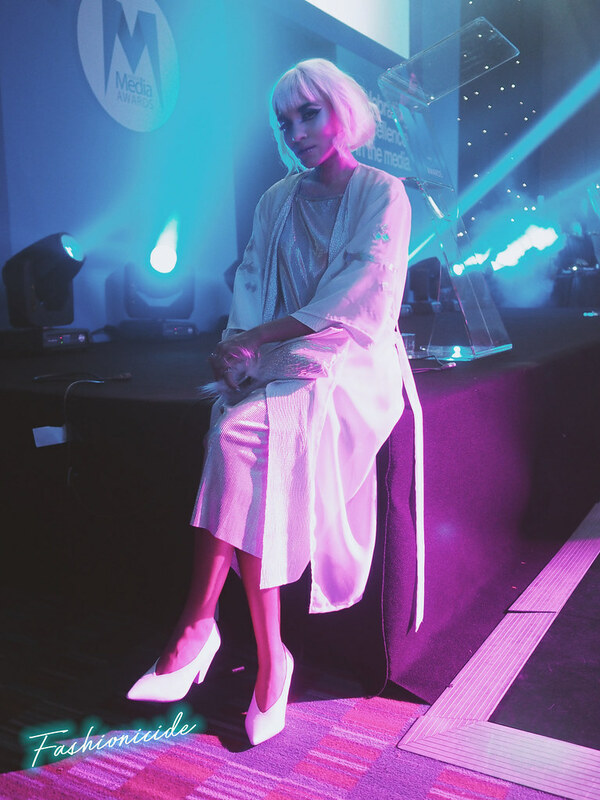 The awards ceremony itself was pretty long, but that's really testament to just how many talented Asians there are out there in the media industry, consistently putting out great work whether its TV, Radio, Film, Documentaries, Newspapers, Magazines, YouTube and of course, Blogs. It was really inspiring to hear the struggles that so many of the winners have had to endure in order to get to where they are now. Asians face pressures from our own communities, our own families even, as well as the additional challenges of racism, a lack of representation and opportunities. But we are a resilient, talented and creative bunch, and the AMAs really give us a platform to show that off, and celebrate our achievements together. 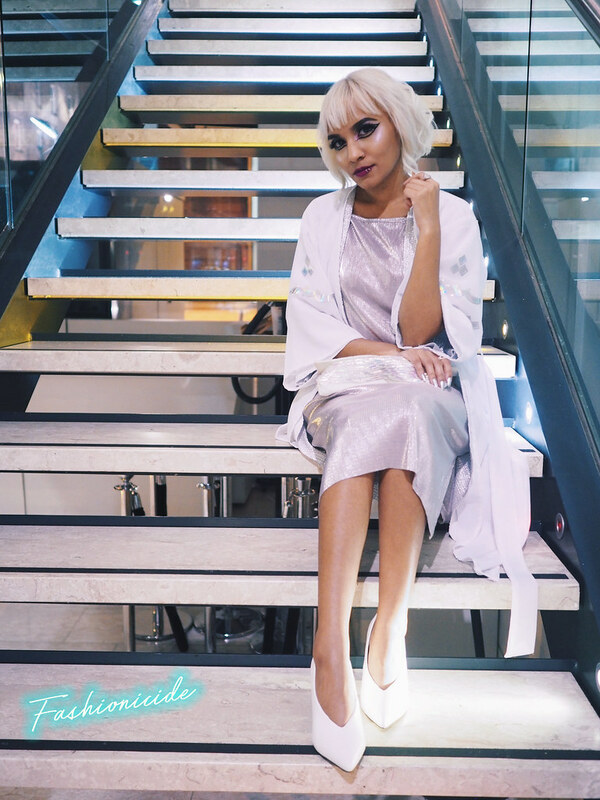 But the most surreal thing of all was having random people come up to me, particularly Asians, and ask "Are you Halima, from Fashionicide?" This happened so, so often! Some just wanted to compliment my outfit (more on that later), others said they'd seen my blog and thought it was amazing and others even started fangirling! WEIRD BUT COOL. Also, one of the judges for the Best Blog category pulled me over to one side later on and said she was really impressed with my work, not just the makeup and style that I'm known for, but also some of the lifestyle content I've been putting out this past year as well as the level of engagement I get from readers. These were words of real encouragement, because it's nice to hear that people read the blog, take note of what I say and form opinions, instead of just looking at the photos and thinking "Oh, that's pretty." I found that the Asians I was meeting and talking to, seemed quite different to the Asians I've met throughout everyday life (with some notable exceptions), in that they came across as far more professional, respectful, intellectual and interesting, but seemingly without passing judgement. This was fascinating to me, because it's clear that Asian creatives take a verbal beating from the South Asian community, but actually, these people are not bitter about that, they're warm, open and looking to raise up South Asians in general. I've met very few like this, and to me these people were just goals AF. But aside from all that, the undoubted star of the show was my outfit. Off the shoulder dresses seemed to be the trend of the night, but I thought it'd be more memorable to go with something custom made. I already had the concept and vision clear in my mind, so I contacted Kizzy at Kyra Makes Things with my design and she worked her seamstress magic on it to bring it to life. The concept is to reclaim the Urdu word Besharam, meaning "Shameless", which given the messages I was hearing on stage seemed incredibly apt. This concept ties in really strongly with something I'm currently working on behind the scenes, and hope to be able to talk more about in the coming weeks. It's something close to my heart though, as I've been called this word Besharam all throughout my life by South Asians who just don't get that the younger generation might be different to them. 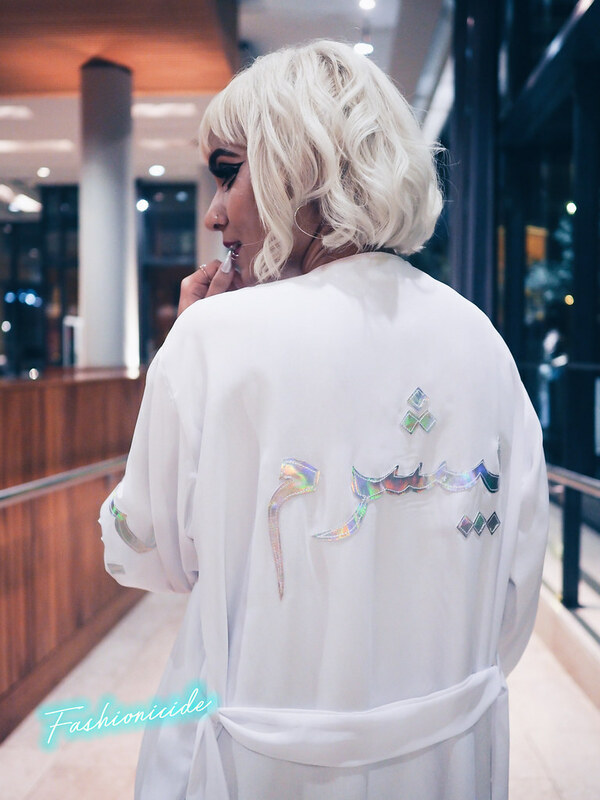 I wanted a floaty white kimono, with the Urdu script for Besharam cut out in holographic material and plastered on the back, and a silver slip underneath and Kizzy produced it exactly to spec, with high quality fabrics and stitching. If you have a design in mind for something custom, I'd definitely recommend reaching out to her for a quote, or even taking a look at her current range on her online store. Kizzy is a really experienced seamstress, and knows exactly what she's doing, even under tight deadlines, so you can trust her to deliver excellent work (as you can see! ), so I was really grateful that she brought my design to life! So yeah, what a night. But it's made me think about my place in the blogging community. I really love blogging, but I think that my future may lie away from it, and on to different and more exciting things. Oh, and on that note, keep your eyes peeled for news of my top secret project in the coming weeks..
Guuuurl, can I please wife you? Mate, that sounds like such a great night! How did the interview on the way in go? I would have been like a deer in headlights! I’m so glad that there was this awesome opportunity to celebrate these fully fabulous Asian creatives. I love that you’re reclaiming Besharam -and so excited to see what this project is.